Frank, me, and Beulah, Paw Paw Creek, Madison County, NC, 2013. Framing is vital to photography. It provides the structure for all of the elements within the image. What a photographer chooses to include within those parameters become identifiers of that image-maker's interests and concerns. This photograph of our two puppies and me is not meant so much to be a portrait of the dogs although I do love Frank’s eye and coloring. No, if portraiture had been my intent, I would have placed them in better light and included their complete selves. 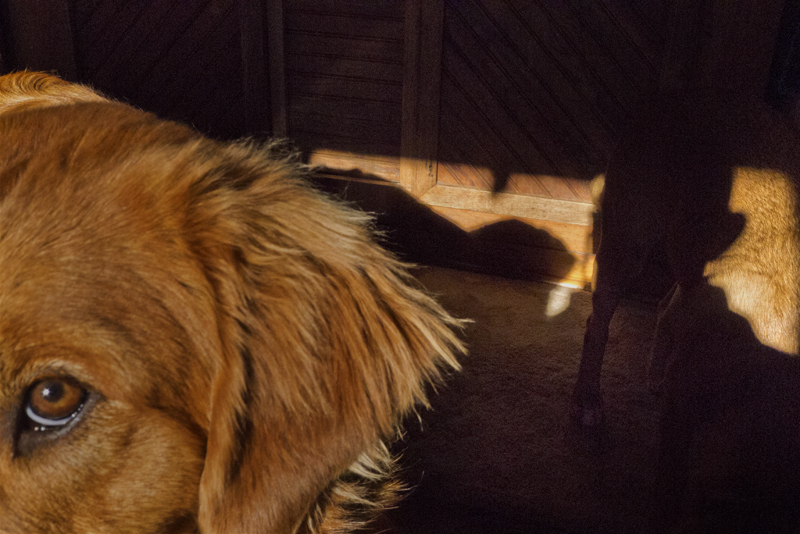 Rather, the photograph is about light and how that light interprets my relationship with the dogs. It’s about shadows and highlights, sharp and fuzzy, real and imagined, and spontaneity. I recently posted a cartoon on my FB timeline. In it, a psychiatrist is sitting in a chair with a patient on the couch in front of him and the shrink says, “Go home and let your dog lick your face. Dog saliva is the most effective antidepressant you can get without a prescription.” These dogs are like that.